Mushroom soup is a simple type of soup where a basic roux is thinned with cream or milk and then mushrooms and/or mushroom broth are added. It is well known in North America as a common type of condensed canned soup. 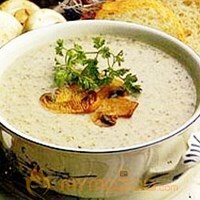 Cream of mushroom soup is often used as a base ingredient in casseroles and comfort foods. This use is similar to that of a mushroom flavored gravy. 1 Melt the Butter in a pan, add the Mushrooms and cook them for 5 minutes stirring constantly. 2 Add the Chicken or vegetable stock, raise the heat and bring to a bOil. 3 Remove the Mushroom mixture from the heat. 4 Beat 1/2 cup of hot broth with the Egg Yolk unTil the mixture becomes frothy. 5 Gradually pour this mixture into the Mushroom mixture, stirring constantly to prevent the mixture from Curdling. 6 Return the pan to the heat and add the Milk, Salt and Pepper. 7 Reheat uncovered, stirring constantly, but do not let the soup bOil. 8 Serve the Mushroom soup hot.